Combine marinade ingredients in a plastic bag. I use a produce bag. Cut chicken into bite size 1-inch pieces and add to marinade. Set aside. Prepare vegetables and add to marinating chicken. Toss well. Place chicken & veggies on a large plate for easier handling. Thread onto skewers and sprinkle both sides with salt and pepper. Note: For more on this recipe in my blog, click here. 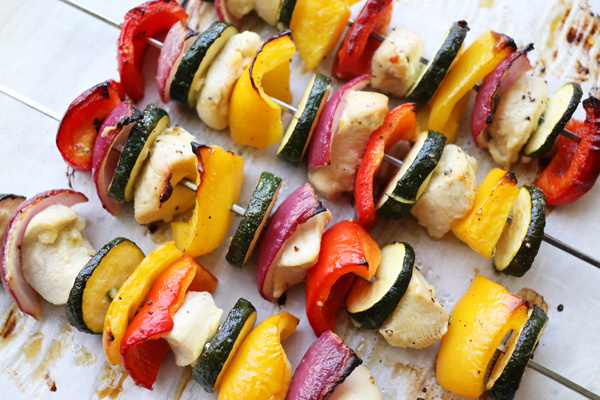 23 Comments on "Oven Chicken Veggie Kabobs"
They look delicious is there a recipe for the balsamic rice that sounds great would like to give it a go! Basmati is just a fragrant white rice that cooks in water like any plain rice. Not all brands are equally good. The brand I use (“The Real”) cooks in 10-12 minutes. I absolute love this recipe. Thank you so since. I really wish you would make some more of your fun videos. You are so much fun and we people who can’t cook we’ll learn so much! Thanks so much for your recipes! I will try this soon! I think I will try marinating tofu ! Not sure it will hold up but going to try! Sending many hugs. Such a wonderful yummy recipes. Another creative culinary delight. Yippee!! I only eat chicken and never thought of doing this! This looks so delicious!!!! Jenny, thanks so much for making cooking so easy!!!!!!!!!! This is my first ever to see your recipe and never know how to kabob anything. Thank you for this valuable data that i will step into this new horizon to hopefully discover new experience for my life and family. Grandpa Dale. Very simple, like it, especially the marinade. Just what I use on my salad. Is there any length of time the chicken should marinade ?. Do the skewers need to be turned during the cooking time. I clarified both questions in the recipe, thanks. Great to hear from you Jenny. This is one simple and wonderful recipe, like a touch of summer in the midst of icy cold winter. I have been making kabobs for years but to be honest never have used a marinade so I’m anxious to try this one soon. Thanks for sharing. Hi Jenny! Can I use thigh meat? Or would that not make it healthy? Chicken breast is leaner and is easier to work with. There is a lot of fat on chicken thighs that should be removed first but you can use thigh meat. It is so weird I just told my husband I was thinking about you and all the terrible weather in your area on the news!! Pop I see an email from you!! Stay safe my friend, know that someone is always thinking about you!! Hi Jenny, Nice to here from you. Just got the recipe but will try it this wknd. Thank you so much, Your the best. Can’t wait to make this. Thanks for another winner, Jenny. Great to hear from you Jenny! Thanks for the chicken kabob recipe. Looks delicious, love that I can cook them in the oven (usually it’s a summer recipe cuz I use the grill). All the best from 🇨🇦 Brrrrrrrr….. Going to try these, Hubby loves Kabobs. I have never tried these in the oven. I bet their going to be very tasty…just like your other recipes!!! This new recipe looks amazing! Food on a stick….who doesn’t love that! I just saw it today, but I am going to make it this week. Thanks I love that is an oven recipe….so easy.